On this 70th anniversary of independence, it is appropriate to dwell on the economic and social achievements of the nation since regaining independence in 1948. Despite the economy’s underperformance discussed in last Sunday’s column, there have been significant social and economic achievements since independence. The structure of the economy has been transformed from a predominantly agricultural one to a more diversified one. We have reached middle income status with a substantial increase in per capita income. Attainments in health, life expectancy, literacy and education are impressive. The seven decades have been a period of economic and social transformation. The country’s social and human development has outperformed countries with higher per capita incomes and earned the country a high position in the United Nation’s Human Development Index. Although the economy grew by only around 4 percent, it has undergone a structural transformation with agriculture’s predominance in the economy being overtaken by industrial and services sectors. Per capita incomes have risen significantly, poverty and unemployment have been reduced and the country’s economic and social infrastructure has improved considerably. The most significant achievements have been in the country’s human development that is far better than most developing countries and even some developed countries. Mortality rates are low, life expectancy has reached 75 years, adult literacy has increased to over 90 percent and education has expanded significantly. Most people enjoy far better social amenities than seven decades ago. Largely owing to the improvements in health and education, the country has gone through the three phases of the demographic transition in the first half century after independence and entered the fourth stage of an ageing population. The country’s population growth of 2.8 percent per year in the 1950s has been reduced to less than 1 percent (0.9). Yet the annual population growth is about 200,000, as in the 1950’s. One of the most significant achievements since independence was the attainment of self-sufficiency in rice. At independence, the country with a population of only 7 million imported about half her requirements of rice and much of her other essential foods. Today with a population of 21 million Sri Lanka is about self-sufficient. The seventy years since independence have witnessed profound and irreversible economic changes. The economy has moved from a pre-dominantly agricultural one to one in which both industry and services contribute more to GDP. The growth of industry for export has been a striking development of the last two decades. Not only has the relative importance of agriculture declined, but its composition too has changed. 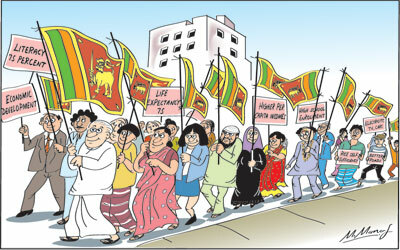 The economic reforms since late 1977 had a significant impact on the structure of the economy and changed the basic character of the Sri Lankan economy. The share of manufacturing in GDP has increased. Currently the contribution of agriculture to GDP is only 7 percent. The industrial sector (including construction) contributes about 40 percent to GDP. There has been an increase in the contribution of the services sector to 55 per cent today. These structural changes in the economy are reflected in the country’s trade pattern. Agricultural exports that dominated the export structure from the beginning of the plantation economy till the 1980s declined to 27 per cent in 2016. Industrial exports amounted to 77 percent of total export earnings. These proportions of exports are to some extent misleading. Agricultural exports are more significant than suggested by the 27 percent as value added in agricultural exports is much higher than in industrial exports. Notwithstanding these compositional changes in exports and imports, Sri Lanka’s trade dependence (imports and exports as a proportion of GDP) remains high. In 1950 the country’s trade dependence was 70 per cent. It was about 45 per cent in recent years. The character of the trade dependence has altered significantly. The trade dependence is more industrial than agricultural. Manufactured goods dominate exports. Raw materials and capital goods for industries account for a larger share of imports than food and other consumer imports. There has been substantial increases in incomes. Per capita incomes have increased fourfold to the levels of a middle income country, poverty has fallen to 6.7 percent and unemployment is only 4.7 percent. Social development after independence in 1948 is impressive. There have been significant improvements in literacy and school enrolment, reduction in mortality rates, an increase in life expectancy and significant improvements in social amenities such as housing, potable water, sanitation and access to electricity and telephones. The country achieved the Millennium Development Goals (MDG) set for 2015. Life expectancy at birth increased from around 55 years at the time of independence to 75 years today. Life expectancy at birth is higher for females at 77 years than for males at 72 years. There have been significant improvements in maternal mortality, infant mortality and under 5 mortality. Maternal mortality decreased from 560 per one hundred thousand live births at the time of independence to 100 in 2015, while infant mortality declined from 82 to 8.2 per thousand in 2013. Under 5 mortality has declined to less than 19 per thousand. Adult literacy increased from 57.8 per cent in 1945 to 93 per cent in 2016. Female literacy improved more sharply during this period from 43.8 per cent (1945) to 92.4 per cent and male literacy increasing from 70.1 per cent to 94.1 per cent in 2015. School enrolment of children between the ages of 5 – 19 years increased from 54.1 per cent (1945) to 75.2 in 2016. The Human Development Index (HDI) is at 0.743 (2015) and the country ranks 99 of 177 countries. This ranking is above those of most countries at similar levels of income and higher than other South Asian countries. However, most countries in East Asia and South East Asia, such as Singapore, Malaysia and the Republic of Korea that were behind the achievements of Sri Lanka in the 1950s and 1960s, have overtaken us. Despite the improvements in mortality rates, literacy and school enrolment, high rates of diseases associated with poverty and poor living conditions persist. Further, the quality of health and educational services leaves much to be desired. There are also significant regional disparities and urban rural differences. The progress in social indicators could have been much better in recent years, if economic growth was more rapid. Notwithstanding these qualifications there is no doubt that the country’s social and human development indicators are impressive. This comes out very clearly when comparisons are made with other developing and even some developed countries. Amartaya Sen has placed a very high value on life expectancy as it is a composite indicator and the basic aspiration of humans. He has pointed out that life expectancy in Sri Lanka is significantly higher than those of countries with similar, and even some countries with higher, per capita incomes. There have significant developments in agriculture. Ceylon in the 1950’s with a population of just 7 million imported about half her requirements of rice. Today, Sri Lanka with a population of 21 million is self-sufficient in rice in a normal year. The British colonial period of the nineteenth century introduced plantations and neglected paddy and other food crop agriculture. This process was reversed from around the third decade of the twentieth century. Paddy and food crop production became the centre of growth in the 1950′s and 1960′s. Paddy production increased due to an area expansion and increases in yields with high yielding varieties adopted by farmers. Consequently the country has achieved self-sufficiency in rice inspite of a threefold increase in population. Although the country has achieved much in these 70 years of independence, it has been inadequate to resolve pressing social and economic problems of poverty, unemployment and inadequate incomes for a significant proportion of the population. The lack of pragmatism in economic policy formulation, ineffectiveness in implementation of economic programmes, excessive opposition to reforms, irresponsible union actions, and indiscipline, deterioration in law and order, weakened public administration and inability to resolve the ethic crises have all enfeebled economic progress. Other nations that were behind us have overtaken us. The pace of economic growth cannot be accelerated adequately until peace is achieved and our vision is focused on reforming political, cultural and social values. The challenge before us in the years ahead is to consolidate these achievements, make qualitative improvements, catch up with the economic development of other countries and face the serious challenges especially in our external finances. National unity, social harmony, pragmatic policies and economic and social reforms are essential to achieve the government’s vision of being a rich and prosperous society in 2025.